What are the Influences of Aggregate in Thermal Conductivity of Concrete? Dear reader in the previous post we have discussed about thermal conductivity of concrete in relation to saturation of concrete. In this post we will discuss about the influence of aggregate characteristics on thermal conductivity. 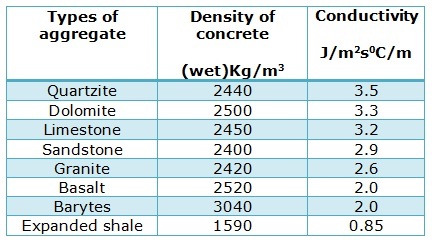 Mineralogical characteristics of these constituents of concrete greatly control the conducive properties of concrete. ACI 207.1R provides some typical conductivity values of concrete, produced from different aggregate. Here we are providing a table similar to that in table 1. Normally the conductivity of rock is increased with its crystallinity i.e. the conductivity depends on direction of flow of heat relative to crystal orientation. Normally trachyte and basalt are found low conductive, limestone and dolomite are of medium conductive and quartz shows highest conductivity. Our aim is to know the concrete response to fire exposure. For better fire resistance of concrete or in high temperature, it is the expected that the aggregate must not contribute to spalling. This is the very important factor of choosing aggregate for concrete production that may be subjected to such extreme environment. 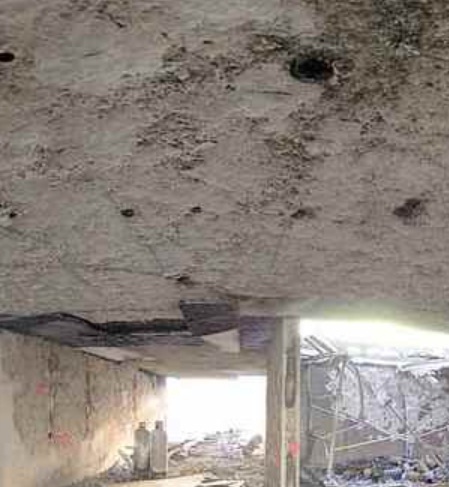 In many tests conducted on different aggregate materials, for fire performance, it is found that siliceous aggregates cause spalling in many cases and in rating aggregate, the aggregates containing siliceous materials get penalty. The aggregates belong to this type, should have less than 30% silica in free state. This type includes all other aggregates except Type-I. Dear reader in the next post we will provide elaborate classification of aggregates in respect to fire resistance and cement types that shows better heat resistance. Please stay with us.